As you all know, me and Riversol have a great relationship. I love their products, and this is my 3rd posting about their skin care line. Founded by internationally-recognized dermatologist, Dr. Jason K. Rivers, and run locally in British Columbia, RIVERSOL skin care products address the needs of the urban, cutting edge customer by delivering superior quality AND proven effects. In 1999, after having practiced medicine for almost 20 years, Dr. Rivers realized that many of his patients were confused about the ingredients and effectiveness of products available in the rapidly expanding skin care market. People said they wanted products that were well tolerated, even for the most sensitive skin. They continuously asked what they should be using on their skin, but Dr. Rivers never felt completely comfortable in recommending one specific product. The Riversol T-Plus Revitalizing Eye Cream ($60) is a luxurious cream for the delicate eye area, contains Hinokitiol (beta-thujaplicin), Propylene Glycol Alginate (from sea kelp) and Palmitoyl Oligopeptide. You can purchase the above Eye Cream, along with other Riversol beauty products at the Riversol website. You can WIN a full sized eye cream, valued at $60 by simply posting a comment on this site, telling me something you learned after visiting the Riversol site. Simple right? Of course it is!!! If you would like extra entries you can follow this blog, subscribe, add me to your blog roll, grab my cute button, blog or follow me on networked blogs for TWO entries each. You can also follow Riversol on Twitter and Me on twitter, and tweet about this giveaway once a day!!! Giveaway closes 6-6-10 11:59PM Winner will have 48 hours to respond to the winning email, or another winner will be chosen. Open to the US and Canada 18 + only. The company has been incorporated since 2005. The ingredients have been under review for over 5 years. 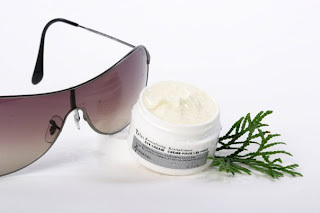 I learned that Riversol is the skin care provider of the Canadian freestyle alpine team. I am a subscriber to your email. I learned that the key ingredient is sourced from red cedar trees. I learned that T Plus products have not been tested on animals and are designed to be non-irritating. I learned Thujaplicin is now known to be a potent antioxidant that has the ability to reduce sun-damage to the skin, and improve the skin clarity and texture. I learned the good doctor has been published many times. Dr. Rivers has been dedicated to public awareness of sun and skin issues for the past 17 years. He has done extensive scientific research (135 papers published so far). I follow on Networked Blogs too. I learned that the gel cleanser is designed for all skin types, this gentle foaming cleanser is formulated to remove excess oil and impurities without harsh detergents. I learned that Riversol Skincare is proud to be the exclusive skincare provider to the Canadian Freestyle Ski Team. 1. I follow you on GFC as frugal tumbleweed acres. 2. I follow you on GFC as frugal tumbleweed acres. I learned that Riversol Skincare is the exclusive skincare provider to the Canadian Freestyle Ski Team. I learned that the Dr has written and published 135 papers! Run locally in British Columbia,Canada by dermatologist Dr.Jason Rivers. I learned... Riversol Skin Care Inc. was incorporated in 2005. The ingredients found in our products have been under review for more than five years. I learned they don't tested on animals. I learned that Dr. Rivers has done extensive scientific research (135 papers published so far). the most important ingredient, thujaplicin, is derived from the Pacific Red Cedar tree. Im starting to get fine lines and wrinkles and need help! I learned Riversol took 4 years to develop! and includes anti-oxidants Vitamin C and Vitamin E.
I learned that the product are not tested on animals and do not hurt the skin. I learned that In early 2000, Dr. Rivers began to focus his interest on thujaplicin, an ingredient derived from the Pacific Red Cedar tree. He came to the realization that as a strong anti-oxidant with other therapeutic properties, thujaplicin was perfect for reducing the look of wear and tear on the skin. Awesome!!!! I follow this blog via google connect. I posted your adorable button on my blog. T Plus products have not been tested on animals and are designed to be non-irritating. Dedication to public awareness of sun and skin issues for the past 17 years. Extensive scientific research (135 papers published so far). Fellowship work with major skin cancer organizations in New York and Australia, (The Skin Cancer Foundation and the Sydney Melanoma Unit respectively). His years as a Professor of Dermatology at the University of British Columbia (UBC) and in practice at UBC's Skin Care Clinic in Vancouver. I learned that Riversol is the skin care provider of the Canadian freestyle alpine team and that T Plus products have not been tested on animals. i learned that thujaplicin is perfect for reducing the look of wear and tear on the skin. The Plus line of products were developed with the patient in mind. Dermatologist-developed and recommended. I learned that Riversol products were developed with the patient in mind. And are dermatologist developed and recommended. I am following via Networked Blogs #2. I am following Riversol via Twitter as jlsc123. Dr. Rivers created his products after realizing his clients were confused about product ingredients and their effectiveness. I learned Dr. Jason Rivers is a well-known and internationally-respected Canadian dermatologist. Following riversol on twitter as ky2here1. Following bellasbeautyspot on twitter as ky2here1.